The Bozeman Trail was an overland route connecting the gold rush territory of Montana to the Oregon Trail. Its most important period was from 1863–68. Despite its name, "the major part of the route in Wyoming used by all Bozeman Trail travelers in 1864 was pioneered by Allen Hurlbut". Many miles of the Bozeman Trail in present Montana followed the tracks of Bridger Trail, opened by Jim Bridger in 1864. The flow of pioneers and settlers through territory of American Indians provoked their resentment and caused attacks. The challengers to the route were newly arrived Lakotas and their Indian allies, the Arapahoe and the Cheyenne. The United States put emphasis on a right to "establish roads, military and other posts" as described in Article 2 in the Fort Laramie Treaty of 1851. All parties in the conflict had signed that treaty. The Crow Indians held the treaty right to the contested area and had called it their homeland for decades. They sided with the whites. The U.S. Army undertook several military campaigns against the hostile Indians to try to control the trail. Because of its association with frontier history and conflict with American Indians, various segments of the trail are listed on the National Register of Historic Places (NRHP). The Bozeman Trail (in yellow). While the route was in use, most of the trail crossed the 1851 Crow Indian treaty guaranteed territory west of Powder River. In 1863, John Bozeman and John Jacobs scouted for a direct route from Virginia City, Montana to central Wyoming to connect with the Oregon Trail, then the major passage to the West Coast. Before this, most access to the southwestern Montana Territory was from St. Louis via the Missouri River to Fort Benton. Thence travelers went by the 'Benton Road,' around the Great Falls and through the Chestnut, Hilger and Prickly Pear valleys (current site of Helena and Broadwater County, Montana). Decades before the Bozeman Trail cut through the plains of present Wyoming, the expanse "... was made busy by Crows and white trappers and traders ...". 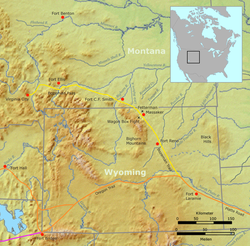 According to the Fort Laramie Treaty of 1851, most of the Bozeman Trail ran across Crow Indian treaty territory. "For the Crows, the Bozeman Trail introduced them to a relationship [emigrants and army personnel] that would profoundly affect the tribe in coming decades". To complicate the matter, the southeastern part of the 1851 Crow domain was taken over by the Arapahoe, the Cheyenne and the Lakota. They had invaded the western Powder River area during the 1850s and after "large scale battles" won this buffalo rich Indian land from the original tribe around 1860. The principal Bozeman Trail conflict took place along the roughly 250 miles of southern wagon wheel tracks through this particular area. Usually, the emigrants could breathe again, when they started on the last nearly 190 miles of the trail westward from the crossing of the Bighorn River to the city of Bozeman. During the few years the trail was open to emigrants, 3500 traveled it. Indians killed between 40 and 50 of them. The short cut was at the time "most often called the road to Montana" and not the Bozeman Trail. While short in bee line, the actual road from the Oregon Trail to the mining towns was much longer due to the hilly and undulating terrain. Shorter or longer stretches of the route were altered every year to avoid the worst stages. The journey took around eight weeks. Many of the travelers had prepared themselves for the arduous trip by reading John Lyle Campbell's popular guidebook. Drowning and fatal accidents with firearms occurred. Some travelers came down with critical diseases such as "mountain fever" (Colorado tick fever) and never made it to their destination. Game like elk, mountain sheep and bear was shot an occasion, also buffalo. "The men are killing them in large numbers. I feel sorry to see such destruction. They leave tons of good meat every day to be devoured by wolfs at night", lamented travelers Richard Owen in 1864. The travelers grouped in organized "trains" with chosen people holding posts such as captain, train marshal and orderly sergeant. One group, known as the Townsend Wagon Train, led by Captain A. A. Townsend of Wisconsin, was made up of "wagons ... 150, men ... 375, women ... 36, children ... 36, oxen ... 636". Every fifth of those crossing the plains via Bozeman Trail was a woman or a child. Each wagon paid the train pilot, maybe six dollars in 1864. Being a route used by single emigrants and small families at first, the trail transformed towards a supply route with freight wagons carrying equipment and necessities of life to the new, western towns. Traffic along the trail increased following discovery of gold on Grasshopper Creek, Montana. The trail itself diverged from the Oregon Trail and the California trail to the north through the Powder River. William Tecumseh Sherman authorized construction of three forts in 1866 to guard travelers on the trail. Soldiers were harassed by Sioux Indians, at that time led by Red Cloud (the United States named the war Red Cloud's War after the Sioux leader). Colonel Henry B. Carrington was stationed at a halfway point between Fort Laramie and the Bozeman trail, but his well-fortified position was not attacked directly. However, when Captain William J. Fetterman, acting against orders, led soldiers in retaliation for attacks against Fort Kearny all eighty of Fetterman's men were killed. In the aftermath of the Fetterman Fight the United States agreed, a part of the Fort Laramie Treaty of 1868, to abandon its forts along the Bozeman Trail. In 1866, after the American Civil War ended, the number of settlers who used the trail en route to Montana gold fields increased. Around 1200 wagons brought some 2000 people to the city of Bozeman following the trail that year. The Army called a council at Fort Laramie, which Lakota leader Red Cloud attended. The Army wanted to negotiate a right-of-way with the Lakota for settlers' use of the trail. As negotiations continued, Red Cloud became outraged when he discovered that a regiment of U.S. infantry was already using the route without receiving permission from the Lakota nation. Thus Red Cloud's War began. Bozeman Trail, Fort C.F. Smith, Fort Phil Kearny and Fort Reno and relevant Indian territories of 1851. All three military forts along the Bozeman Trail were located in Crow Indian treaty territory, which had been invaded by buffalo hunting Lakotas. It was impossible for the army to undertake significant negotiations about the traffic through the western Powder River area and the future use of it with Red Cloud and any other Lakota. In 1851, the United States had acknowledged the tract belonged to the Crow and was obliged by that. The Lakota tribe itself had recognized the same. The Army established Fort Reno, Fort Phil Kearny and Fort C. F. Smith along the route, staffed with troops meant to protect travelers. All three military posts were built west of Powder River, consequently outside the Lakota territory as recognized by the whites in the Fort Laramie Treaty. " ... the Sioux attacked the United States anyway, claiming that the Yellowstone was now their land". Indian raids along the trail and around the forts continued. When the Lakota annihilated a detachment under William J. Fetterman at the Fetterman Fight near Fort Phil Kearny on December 21, 1866, civilian travel along the trail ceased. On August 1, 1867, and August 2, 1867, U.S. forces resisted coordinated attempts by large parties of Lakota and Cheyenne to overrun Fort C. F. Smith and Fort Phil Kearny in the Hayfield Fight and Wagon Box Fight. The strikes and attacks on the soldiers "... appeared to be a great Sioux war to protect their land. And it was - but the Sioux had only recently conquered this land from other tribes and now defending the territory both from other tribes and from the advance of white settlers". "In 1866, Red Cloud and his alliance of Lakotas, Cheyennes, and Arapahos fought for a territory they had dominated for only a few years". The troops in Fort Phil Kearny and Fort C. F. Smith got from time to time warnings of imminent attacks from the Crow Indians, who also brought information about the location of Lakota camps. The Crows were all but pleased to see a part of their treaty guaranteed land taken over by hereditary Indian enemies as the Arapahoes, Cheyennes, and Lakotas. Despite resentment against the traffic on the Bozeman Trail, "the Crows still acted as allies of the harassed troops" in the forts. Later, by the 1868 Treaty of Fort Laramie, the US recognized the Powder River Country as unceded hunting territory for the Lakota and allied tribes. Most was located on former Crow Indian treaty territory, now by conquest converted into new Lakota Indian country. For a time the government used the treaty to shut down travel by European-American settlers on the Bozeman Trail. President Ulysses S. Grant ordered the abandonment of forts along the trail. Red Cloud's War could thus be said to be the only Indian war in which Native Americans achieved their goals (if only for a brief time) with a treaty settlement essentially on their terms. By 1876, however, following the Black Hills War, the U.S. Army reopened the trail. The Army continued to use the trail during later military campaigns and built a telegraph line along it. ^ Moulton, Candy: Susan Badger Doyle's two-volume work on the Bozeman Trail blazes some new ground. (Interview with S.B. Doyle). Wild West, Vol. 14, No. 2 (Aug. 2001), p. 56, column II. ^ Doyle, Susan Badger (Ed. ): Journeys to the Land of Gold. Emigrant Diaries from the Bozeman Trail, 1863-1866. Helena, 2000, Vol. 2, p. 743. ^ Kappler, Charles J.: Indian Affairs. Laws and Treaties. Washington, 1904. Vol. 2, p. 594. http://digital.library.okstate.edu/kappler/Vol2/treaties/sio0594.htm. Utley, Robert M.: The Bozeman Trail before John Bozeman: A busy Land. Montana, The Magazine of Western History, Vol. 53, No. 2 (Summer 2003), pp. 20-31. ^ Utley, Robert M.: The Bozeman Trail before John Bozeman: A busy Land. Montana, The Magazine of Western History, Vol. 53, No. 2 (Summer 2003), pp. 20-31, quote p. 20. ^ Kappler, Charles J.: Indian Affairs. Laws and Treaties. Washington, 1904. Vol. 2, p. 594. http://digital.library.okstate.edu/kappler/Vol2/treaties/sio0594.htm. ^ Rzeczkowski, Frank: The Crow Indians and the Bozeman Trail. Montana, The Magazine of Western History. Vol. 49, No. 4 (Winter 1999), pp. 30-47, quote p.47. ^ Medicine Crow, Joseph: From the Heart of the Crow Country. New York, 1992, p. 84. Serial 1308, 40th Congress, 1st Session, Vol. 1, Senate Executive Document No. 13, p. 127. ^ Moulton, Candy: Susan Badger Doyle's two-volume work on the Bozeman Trail blazes some new ground. (Interview with S.B. Doyle). Wild West, Vol. 14, No. 2 (Aug. 2001), p. 56, column I. ^ Doyle, Susan Badger (Ed. ): Journeys to the Land of Gold. Emigrant Diaries from the Bozeman Trail, 1863-1866. Helena, 2000, Vol. 1, p. 1 (total number of travelers); Vol. 1, p. 154 (casualties): Vol. 1, p. XII (altering of route); Vol. 2, p. 744 (guidebook); Vol. 2, p. 759 (mountain fever); Vol. 1, p. 293 (Richard Owen); Vol. 2, p. 767 (organization); Vol. 1, p. 224 (description of train); Vol. 2, p. 435 (ration of women and children); Vol. 1, p. 62 (rate) and Vol 2. p. 435 (freight trains). ^ "In remembrance of the Bear River Massacre". lemhi-shoshone.com/. Retrieved 2013-11-30. ^ "Connor Battlefield". Wyoming State Historical Society. Retrieved 2013-11-30. ^ Hogland, Alison K. Army Architecture in the West: Forts Laramie, Bridger and D.A. Russell, 1849-1912. University of Oklahoma Press. p. 20. ^ Doyle, Susan Badger (Ed. ): Journeys to the Land of Gold. Emigrant Diaries from the Bozeman Trail, 1863-1866. Helena, 2000, Vol. 2, p. 423. ^ Hoxie, Frederick E.: Parading Through History. The making of the Crow Nation in America, 1805-1935. Cambridge, 1995, p. 89. ^ McGinnis, Anthony: Counting Coup and Cutting Horses. Intertribal Warfare on the Northern Plains, 1738-1889. Evergreen, 1990, p. 114. ^ Hebard, Grace Raymond and E.A. Brininstool: The Bozeman Trail. Glendale, 1960, p. 160. Templeton, George M.: Diaries, 1866-1868, (typescript), The Newberry Library, Chicago, pp. 55,59, 72 and 99. ^ Rzeczkowski, Frank: The Crow Indians and the Bozeman Trail. Montana, The Magazine of Western History. Vol. 49, No. 4 (Winter 1999), pp. 30-47. Dunlay, Thomas W.: Wolves for the Blue Soldiers. Indian Scouts and Auxiliaries with the United States Army, 1860-1890. Lincoln and London, 1982, p. 39. ^ Kappler, Charles J.: Indian Affairs. Laws and Treaties. Washington, 1904. Vol. 2 pp. 998-1003. "Archived copy". Archived from the original on 2011-11-26. Retrieved 2011-11-26. CS1 maint: Archived copy as title (link). Compare the 1851 Crow treaty territory with the 1868 unceded Indian territory of the Lakotas.